Each year on August 26th National Dog Day is celebrated to give honor to family dogs and dogs that help keep us safe & save lives. National dog day made the first debut in 2004 by Colleen Paige, an Animal Advocate, and Pet & Family Lifestyle Expert. This special day was created to raise awareness on the vast amount of dogs that need to be rescued from shelters & rescues. On this day, we celebrate the love we have for all dogs in every shape, form, or type. 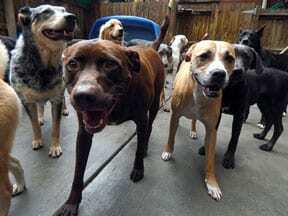 Apart from NDD’s movement, they are against any form of “breed bands” – which means they advocate against purchasing dogs from pet stores supplied by puppy mills, backyard breeders, the internet, and newspaper ads. Instead, when looking for a canine companion, consider adoption. If you have a preference for pure breed dogs, try finding your pure breed dog at a local Atlanta rescue. Furthermore, many times large chain pet stores will host adoption drives for local animal shelters. Some people insist that they must have a purebred dog. Ensure that you locate a reputable breeder. You can verify their reputability by reviewing their licensing, internet reviews, and local references. Adopt a dog from your local shelter or rescue. Volunteer at your local shelter or rescue by walking & playing with the dogs. Conduct an in-home safety test to make sure it is safe for your dog. Donate food, toys, and blankets to animal welfare organizations, shelters, and rescues. Host a national dog day party and invite your neighborhood’s dogs. Give your dog a massage or spa treatment. Give your dog a special treat. Buy your dog a new toy.